Mid-Atlantic serpentine barrens comprise a rare Piedmont grassland community that has been maintained for thousands of years by the magnesium-rich, calcium-poor rocks that underlie it and periodic fires, grazing, and logging activities. Many acres have been lost to development or have reverted to pine-oak forest due to lack of disturbance. 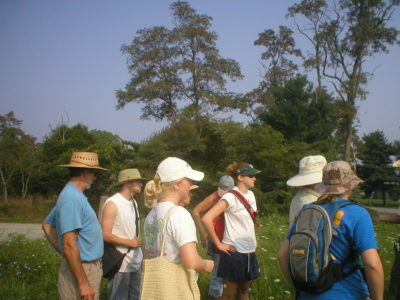 Chris Hoess, Chair of the Friends of the State Line Serpentine Barrens, discusses the natural history of the site as you encounter a variety of rare and unusual species, including Michaux’s stitchwort, round-leaved fameflower, and lyre-leaved rock cress. Bring your lunch and be prepared for hiking over rocky and moderately steep terrain. Although van transportation is available from Mt. Cuba Center on a first-come, first served basis, carpooling is encouraged. For more information on travel arrangements, email us, or call 302.239.8807. For those preferring to meet at the site, driving instructions are provided upon registration.